We live on a windswept ridge. On the plus side, there are views in all directions- rolling fields of corn, oats, and barley. On the minus side, in the winter we are battered by 70 mph winds. Every winter we lose one or two mature trees. Last winter, we lost a majestic willow with five stately branches. Now reduced to a stump.The mature oak trees always suffer some damage. We anxiously check them after a storm. Step over our garden fence, and take 20 paces and you will come to my chosen tree following oak. It’s the tree in the centre of the picture. The oak is about 200 years old and marks the start of a small wood where buzzards nest each summer. 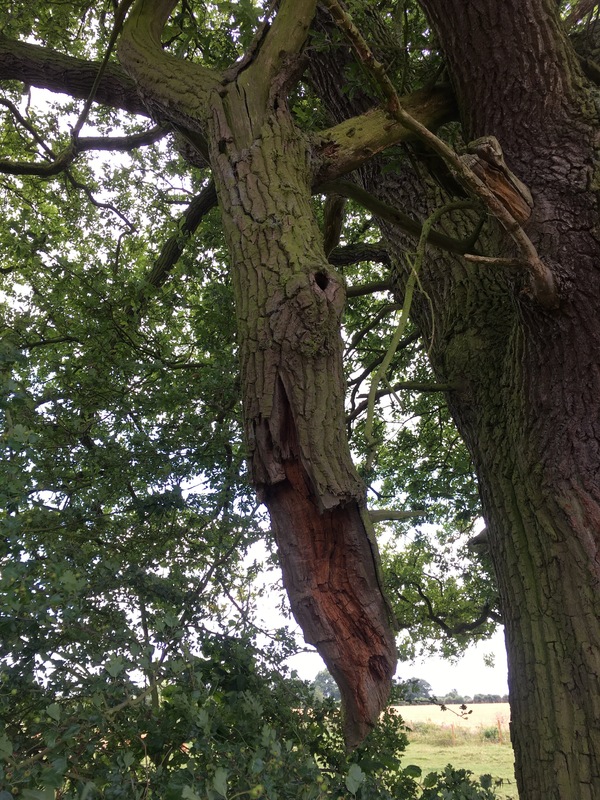 One of the branches, snapped in a storm, has been left dangling. 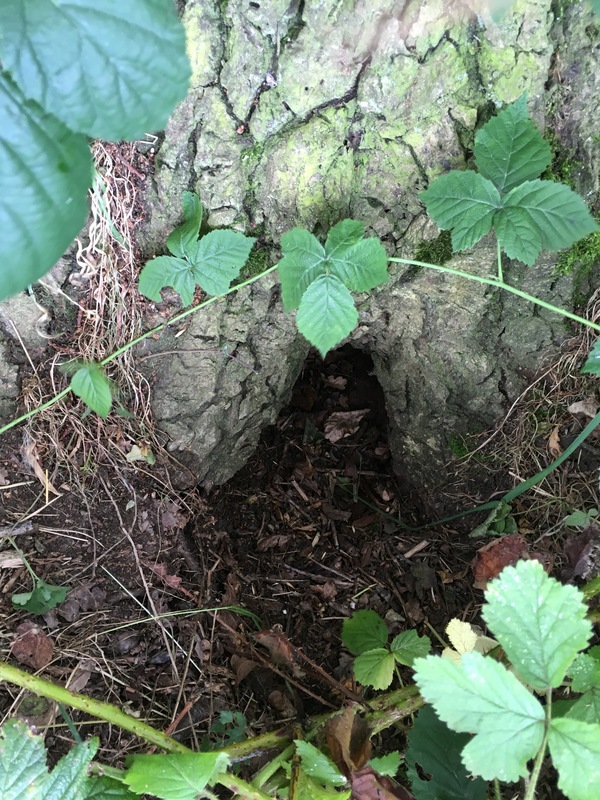 We wonder what lives in the holes and crevices. Something must live in there. We see footprints in the winter. It’s a favourite spot for a picnic in summer. The wide-spreading canopy gives much welcome shade. Here’s Arnie enjoying the cool shade during the recent heatwave. And it’s not just us enjoying the shade. We watched these beauties being born and have enjoyed seeing them grow. It’s a rare thing to see calves reared by their mothers these days. We get a lot of pleasure from seeing them caper around the fields. They seem to be as interested in us as we are in them. They line up along the hedge to watch me working on my vegetable plot. 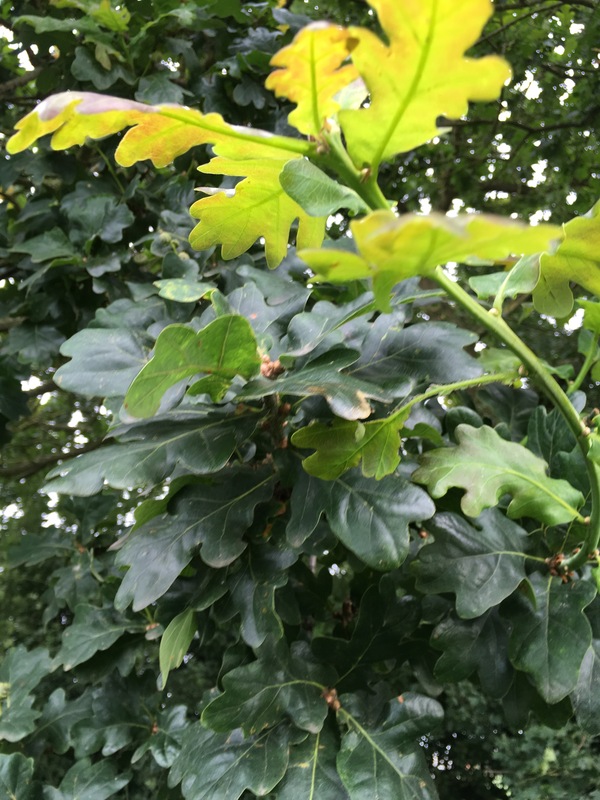 Lammas Day is August 1st and our oak trees have put on the second flush of growth. Lammas leaves look so fresh and green. It’s a reminder that the season is moving on. We sometimes see a woodpecker on the trunk. 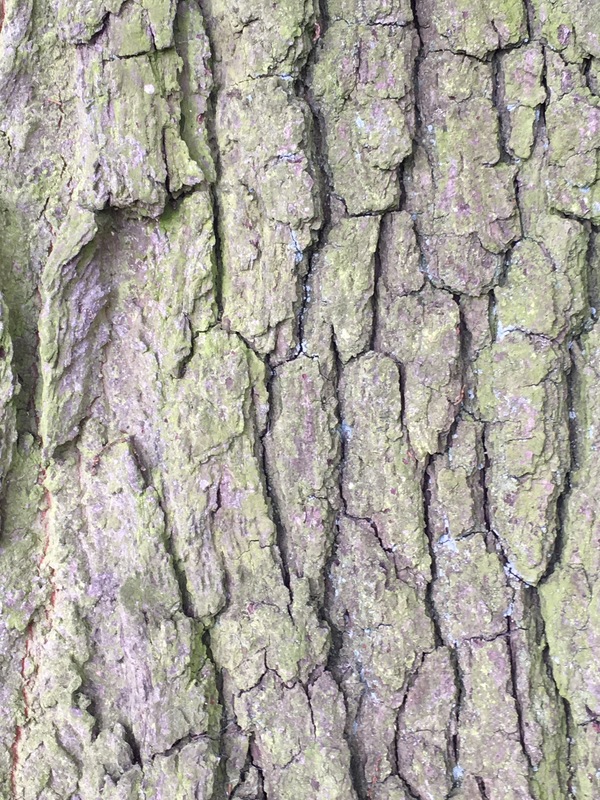 The bark must contain a good supply of insects and grubs. A beautifully scented dog rose wreaths around the sunny side of the tree. There will be plenty of rose hips this year. Thank you to https://squirrelbasket.wordpress.com/tree-following for hosting this meme. 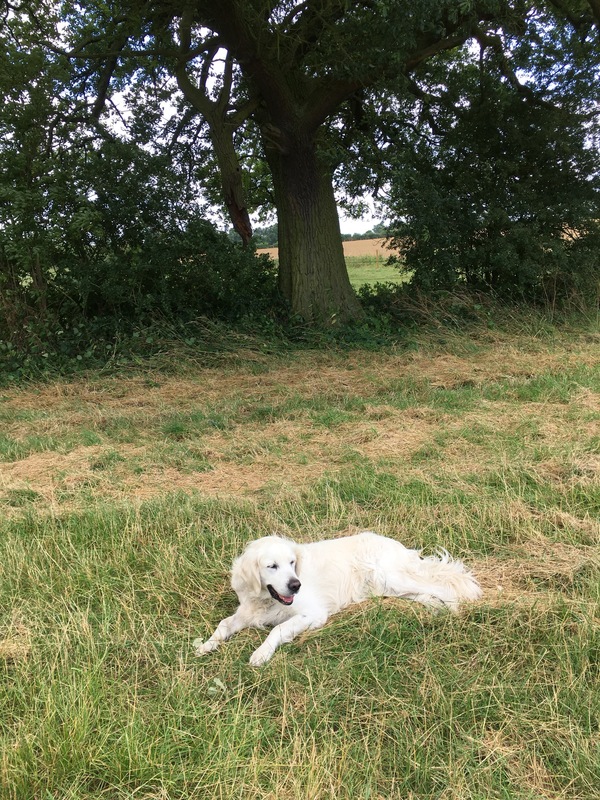 I was inspired to join in by Alison at The Blackberry Garden http://blackberrygarden.co.uk and Mike at Flighty’s Plot https:// flightplot.wordpress.com . Thanks for reading. Good post and pictures. It’s interesting to read about a mature oak in contrast to the young tree that I’m following. Thanks for the comments. Well, I’m keeping an eye on these trees because we’ve had a few people just turning up with chainsaws and chopping off branches. I think the popularity of wood burners might be to blame. 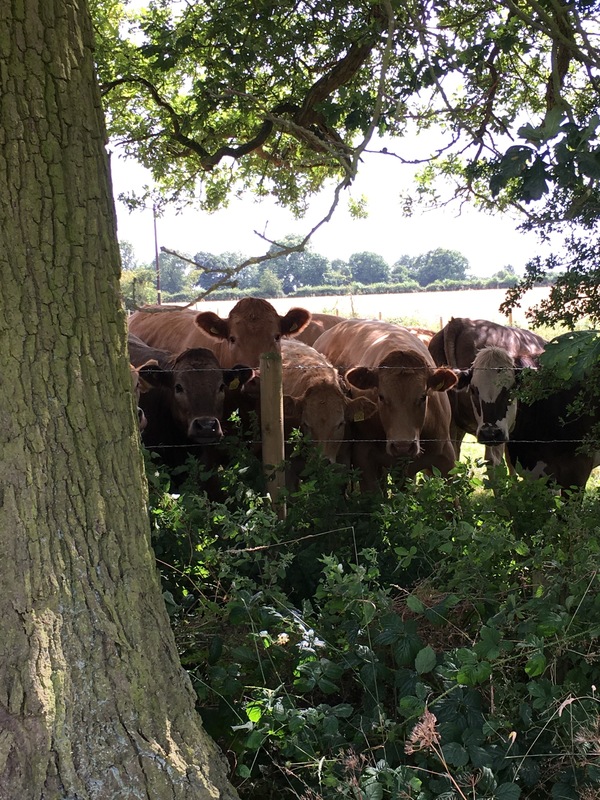 Love those bovine faces – who doesn’t love their curiosity? They are so sweet. They have such a good life in the fields here. We are lucky to live next to an excellent farmer who is kind and compassionate. I grew up with farms up and down the road and cows in the backyard pasture. I love their gentle nature. Thank you so much for joining our band of tree followers! An unexpected treat at this time of year, when I expected people would be flagging. 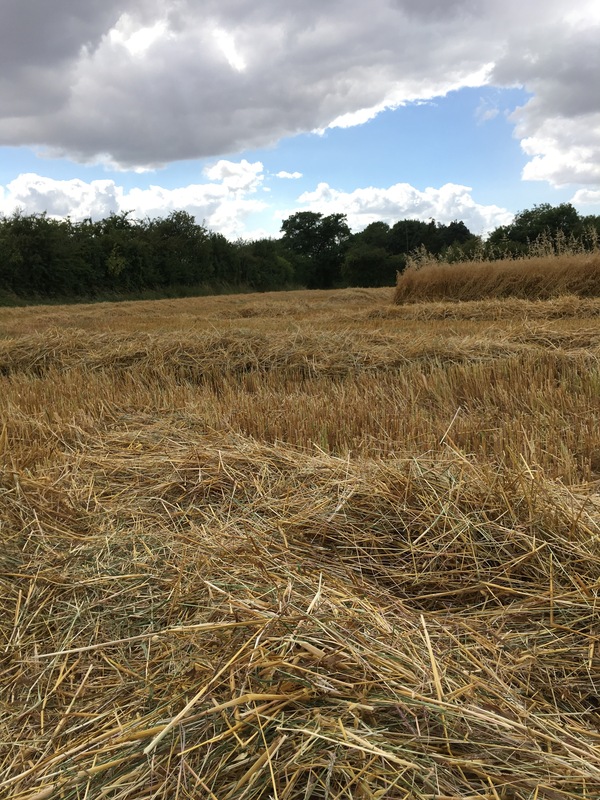 That golden grain is wonderful – it’s all livestock where I live, very little arable. I have added you details to the master list of followers. thanks so much for your lovely comments for your kind encouragement. I learned the Lammas term from my grandfather. When I was little, I can remember a loaf of bread being brought to church. It was made from the new wheat harvested at Lammastide. The loaf was blessed, as a kind of thanksgiving for the harvest. I am writing the blog as a way of trying to remember and record all I’ve learned from my family. It’s good to remember these old traditions. And, looking forward, I too love to learn something new every day. Thanks also for the link up. It’s much appreciated. 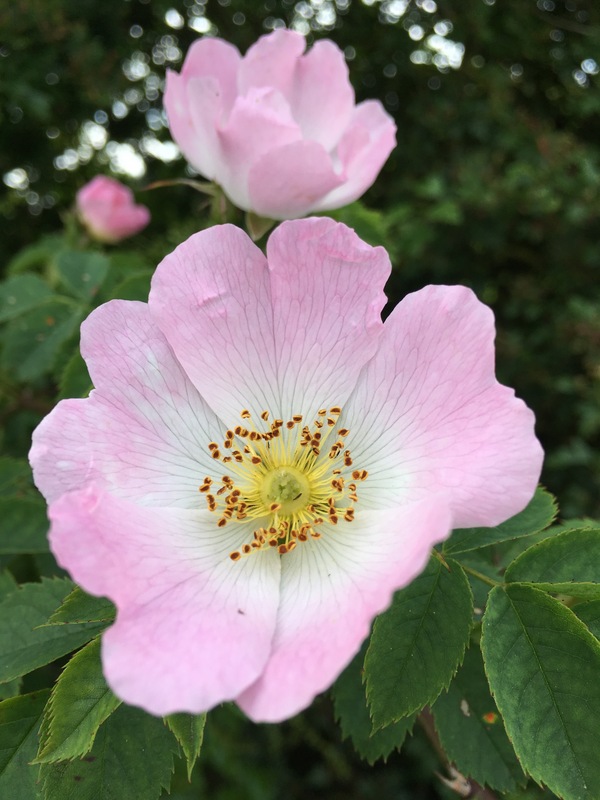 I’ve always loved wild roses…. I love the cattle looking over the fence! I have had a soft spot for cattle ever since I was a child and used to make friends with those that looked over my grandmother’s garden fence. Lovely pictures of the tree, too. I like the way you have drawn attention to all the things that live in and around it. Thank you for your kind comments Ros. My grandmother used to keep cows so I grew up giving them names and fussing over them. My grandfather used to help his mum by delivering the milk before school. In those days it was ladled out into the customers own containers. They didn’t even have bottles, being such a small enterprise with only a few cows. I hope I’ll always live in a house where there’s cows just over the garden fence. Lovely tree following post Karen. Commenting on the impact the tree has for everyone around it is inspired, and we all love an oak. Interesting post Karen. I love oak trees. They are so full of life. Someone calculated that an oak tree in Europe can be host to 284 different insect species!